The nine states—Connecticut, Delaware, Maine, Maryland, Massachusetts, New Hampshire, New York, Rhode Island, and Vermont—have already lowered their total energy-related CO2 emissions 20 percent below 1990 levels by participating in the RGGI cap-and-trade program, first implemented in 2008. The current RGGI cap on electric-sector emissions shrinks from 91 million short tons in 2014 down to 78 million short tons in 2020, and stays constant thereafter. By lowering the RGGI cap even further—to 19 million short tons in 2030—and adding a new emission reduction measure in the transportation sector, Synapse found that the states can save a combined $5.2 billion from 2016 to 2030 and create 50,000 new jobs each year in the region. 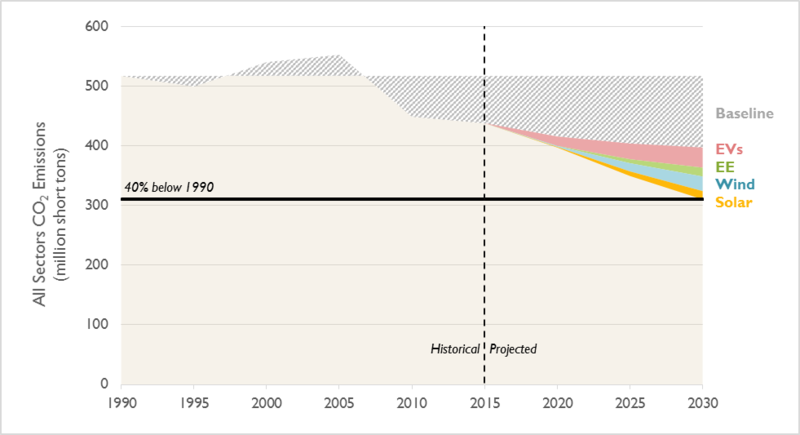 The relative share of each measure in achieving the increased emission reductions, which would total 40 percent reductions below 1990 levels, can be seen in the figure below. Synapse’s modeling suggests that these measures will yield net savings in terms of costs for each ton of emissions reduced.